UK car manufacturing dips -1.0% in October to 151,795 units as domestic demand falls. 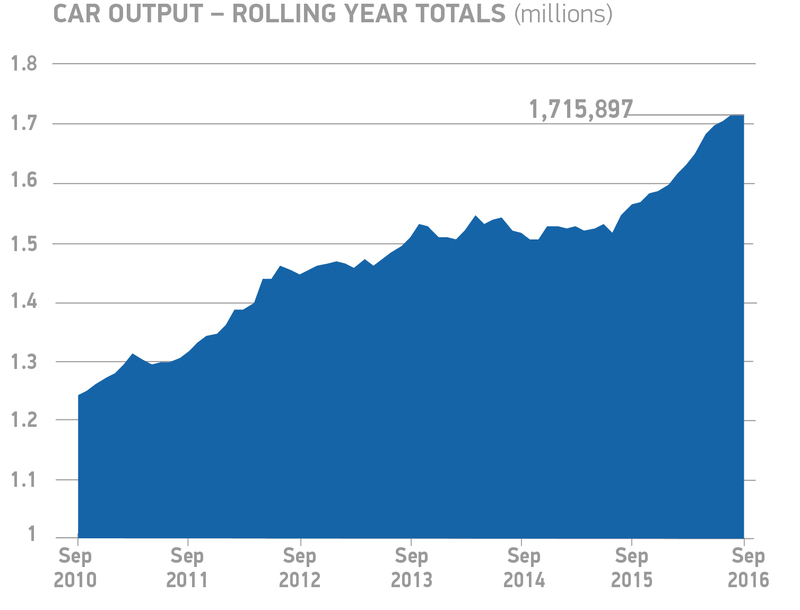 Industry remains strong, up 9.2% year-to-date with more than 1.4 million vehicles produced. 151,795 vehicles were built in the month, with production for export growing taking an 80.9% share of volumes. 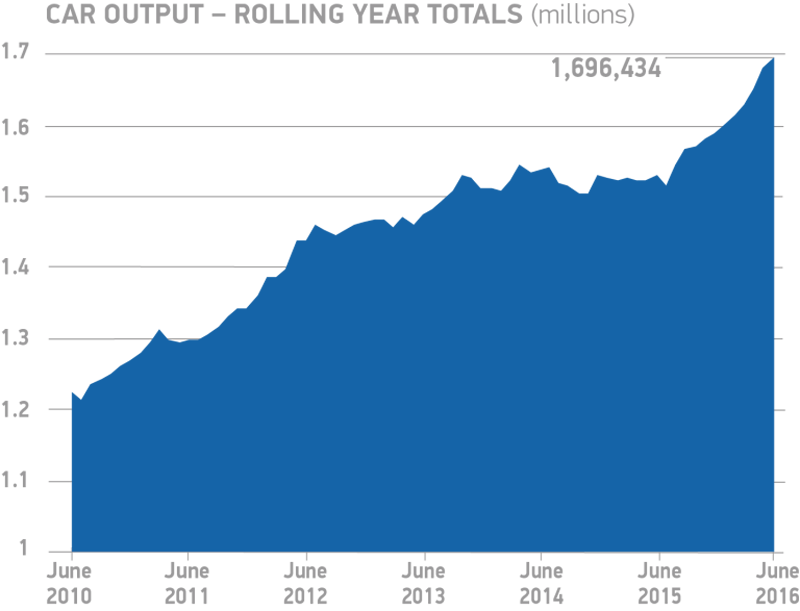 122,765 cars were shipped to overseas customers, an uplift of 1.7% on the same month last year, and offsetting a -10.9% decline in production for the home market. Despite the fall, domestic demand remains strong, with production in the year so far up 3.3% and at its highest level since 2005.3 Overall production levels, meanwhile, achieved a 17 year record of 1,444,248 – up 9.2%. October’s figures underline the export-led nature of the industry, with eight out of 10 cars built for overseas customers. Despite model changes which have ended the consistent growth pattern of the past year or so, we are still on track for a record number of exports. Given this dependence on global trade, it is crucial that British-built cars remain attractive to international buyers and exports are not subject to additional tariffs, costs and other barriers to successful trade. It is also essential government ensures there is economic stability and a competitive business environment to ensure we continue to attract the global investment that is behind this performance. This entry was posted in Vehicle Manufacturing and tagged Mike Hawes, SMMT, UK Car exports, UK car manufacuring on November 26, 2016 by Tim Cosgrove. 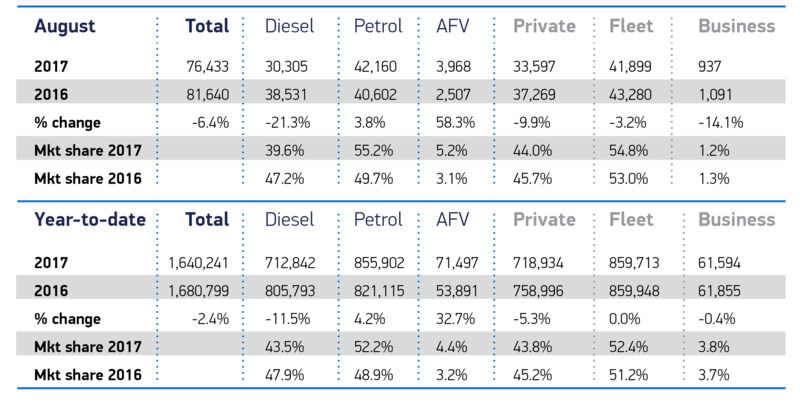 UK car manufacturing volumes increase by 0.9% in September with 159,726 vehicles produced. Overall output for first three quarters rises 10.5% as exports grow 12.2% to hit 1,000,642. Overseas demand drives production, up 5.0% to 123,119 units, while home market falls -10.6%. 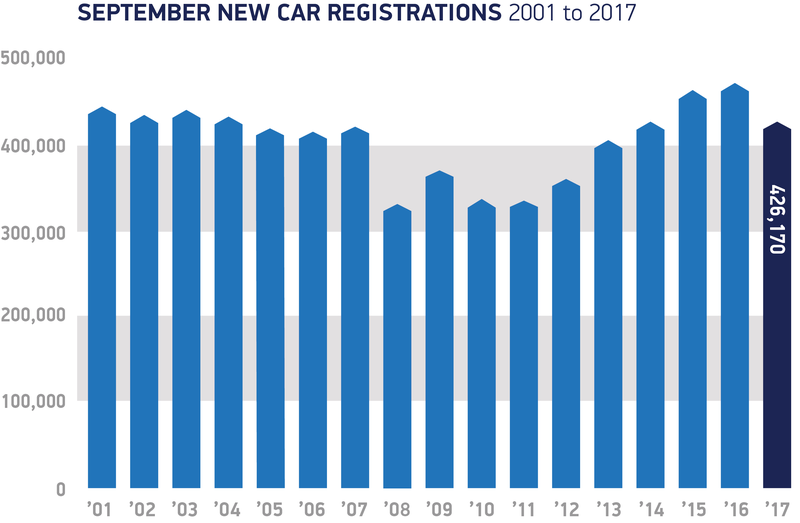 UK car manufacturing reported steady growth in September, with production rising by 0.9%, according to figures published today by the Society of Motor Manufacturers and Traders. Exports rose 5.0% to reach 123,119 units, offsetting a -10.6% decline in production for the home market. 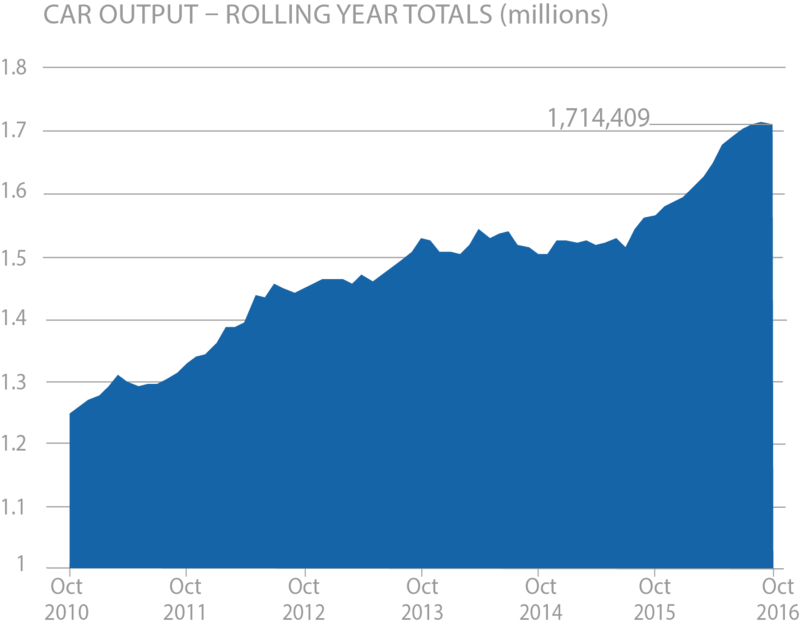 Overall year-to-date output increased 10.5% to 1,292,453 units, as production for global markets grew for a 14thconsecutive month. Export demand rose by 12.2% to take volumes past one million in the first three quarters for the first time on record. 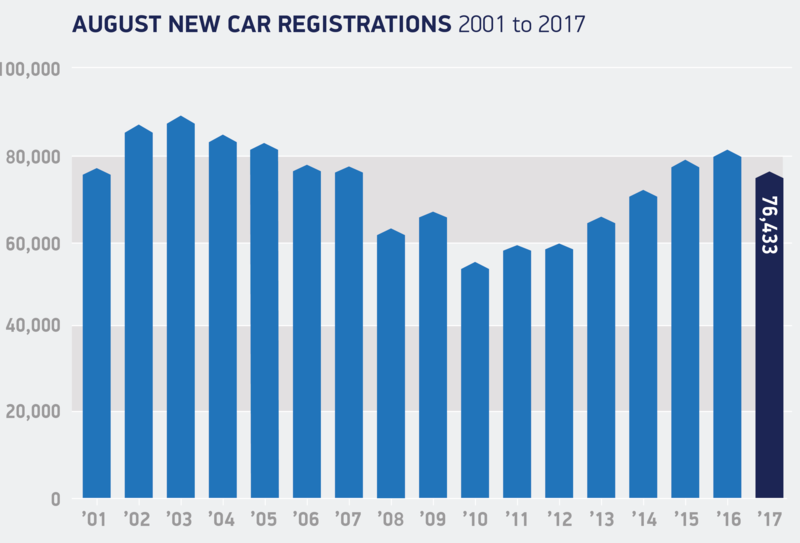 British-built cars are in demand across the world as demonstrated by the double digit growth in exports this year, resulting in more than a million cars produced for international markets. The vast majority of cars manufactured here in the UK are destined for abroad and future growth will depend on securing our international competitiveness and the barrier-free access to major global markets that has enabled UK Automotive to thrive. This entry was posted in Vehicle Manufacturing and tagged Mike Hawes, SMMT, UK automotive industry, UK car manufacturing on October 28, 2016 by Tim Cosgrove. Continental is electrifying one diesel variant of both the new Renault Scénic and Grand Scénic models. The system, offered as a “Hybrid Assist” uses a 48-volt hybrid drive in production vehicles for the first time. The technology is a particularly cost-efficient solution to significantly reduce fuel consumption and exhaust emissions. Instead of the conventional starter generator, the system uses an electric motor with a continuous output of six kilowatts (10kW temporary), which drives the crankshaft of the engine via a belt. The electric motors with integrated inverter are supplied from the Continental plant in Nuremberg. Since 2013, Continental engineers have been working together with Renault on a hybrid drive, which is so cost-efficient to produce that it becomes an appealing option for mid-size vehicles. To achieve this, the development partners have used low-voltage hybrid technology, which operates at 48 volts. This is in contrast with the considerably more expensive high-voltage technology, which operates at between 300 and 400 volts and is usually used in hybrid vehicles. However, the 48-volt system facilitates significant savings. Therefore, with the mild-hybrid system, Renault is aiming for combined fuel consumption of 3.5 liters of diesel per 100 km. They are also aiming to reduce the new Scénic´s CO2 emissions to 92 grams per kilometer, which is a new CO2 benchmark in this vehicle class. This is possible because the electric motor, operated as a generator, also converts a large proportion of the braking energy into electricity, which is temporarily stored in a small battery. This electricity can then be specifically used to relieve the internal combustion engine. This is also the reason why nitrogen oxide emissions and exhaust particles, especially in urban traffic, are reduced when a 48-volt drive is combined with a diesel engine. The 48-volt solution from Continental is relatively easy to combine with preexisting internal combustion engines, as it does not require any more room than a conventional starter generator. This is due to the high power to size ratio of the electric motor, which does not contain rare earth materials. This is achieved by water cooling of the stator and the high efficiency of the induction motor. To save space, the inverter, which is needed to convert direct current stored in the battery into alternating current required for operation, is integrated in the housing lid of the motor. The ready-to-install 48-volt drive is manufactured at the Continental plant in Nuremberg, which already specializes in complex electronic modules, such as those used for automatic transmissions. In addition to designing the 48-volt drive for the crankshaft of the internal combustion engine in Renault vehicles, Continental is also working on other solutions. The electric motor can also be placed between the engine and transmission – allowing, for example, purely electric driving in inner city areas. This entry was posted in Vehicle Manufacturing and tagged 48 volt car, Continental, hybrid aftermarket, hybrid cars, Renault Grand Scenic, Renault Scenic on October 27, 2016 by Tim Cosgrove. Double digit growth for UK car manufacturing in June as output rises 10.4% to 158,641 units. Best half year performance since 2000, with 897,157 cars produced – up 13.0% on 2015. Future growth uncertain, as SMMT survey highlights industry concerns over trade and investment after Brexit vote. 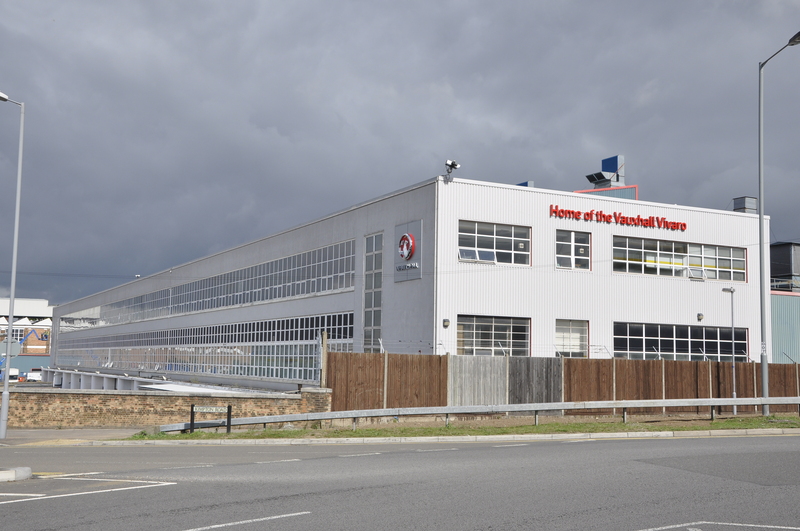 This entry was posted in Vehicle Manufacturing and tagged Mike Hawes, SMMT, UK car manufacturing, uk car production on July 28, 2016 by Tim Cosgrove.